But the reality is, my 1- and 3-year-old eat just like any other kids 鈥� and in today鈥檚 world, that means a lot of pouches. The little four-ounce portable plastic containers with pre-made pur茅es come out multiple times a day at my house. 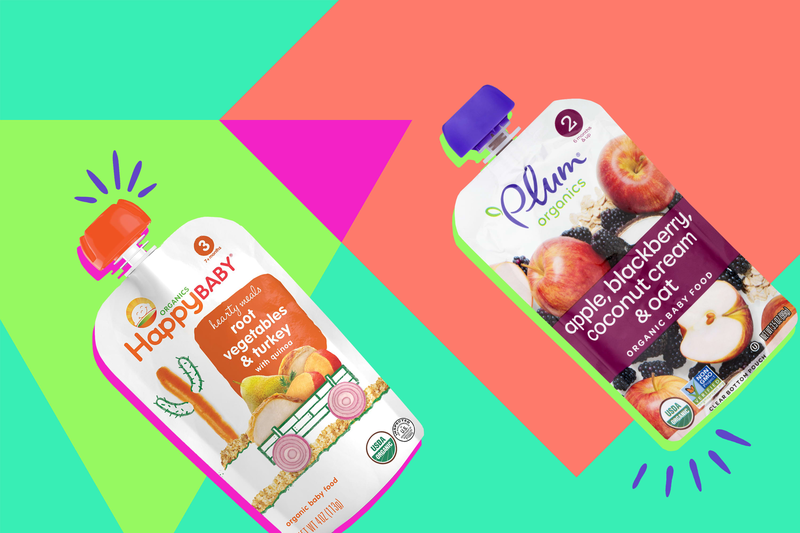 We aren鈥檛 the only ones: According to the New York Times, 25 percent of baby food sales today are pouches. It鈥檚 not surprising to anyone who has looked around in a park lately, where every kid from 6 months to 6 years old grips the plastic pouches. Once I asked my mom to grab some baby food on her way to visit, and she reported that the store no longer even sold jars 鈥� we鈥檙e living in a pouch-only society now. The pouches started to invade my house with my older daughter, the picky eater, who lived on thin air and saltine crackers, as far as we could tell. Her insatiable desire for pouches at least made us feel like she was eating something. My younger daughter, on the other hand, eats everything. If it鈥檚 not nailed down, she鈥檚 trying to get it in her mouth. After two whole nectarines, toast, and a pair of eggs at breakfast, I鈥檓 handing over the pouch to buy myself enough time to grab a jacket before we head to school (where they serve her a second breakfast). I tried to make my own pouches. I whizzed together $4 bunches of kale and precious homegrown tomatoes from the garden. I think the kids could smell my fear as I handed them over. The consistency was wrong, a nubbin of cauliflower would get stuck in the tube and when squeezed, explode out the bottom. Inevitably, I hand over the pouches that we now bulk-order from Amazon 鈥� the heartiest kind for my bottomless pit and the kind I can purchase by color for my picky eater, who insists on the purple pouches. I Love Food! Is Giving into the Pouch a Failure? I spend all day reading and writing about food 鈥� I鈥檓 well aware of the drawbacks to the pouches beyond the non-recyclable waste. While the pouches get kids eating vegetables, they don鈥檛 teach them to eat. Once they have teeth, the pur茅ed food isn鈥檛 good for them. They鈥檙e expensive. They鈥檙e wasteful. Kids don鈥檛 learn the taste of the vegetables. The list of drawbacks is long and looms over the part of me that wants my kids to someday dig into roasted broccoli and saut茅ed spinach with me. For the first year of reluctantly handing the pouches to those chubby baby paws, at a loss for what else to feed my picky kid, I felt guilty. Shouldn鈥檛 I be able to out-cook her pickiness and advocate for a few extra minutes at the stove to make that pur茅e out of farmers market ingredients? We all have battles we pick as parents, and I think people assume, as a food writer, mine might be feeding my kids the unattainable ideal meals. But we sit down to two meals a day, always with a wide variety of foods available, even if the older one won鈥檛 touch most of them. We shop the farmers market together weekly, where both kids know the best stands for samples. They might eat many pouches a day, but they know where food comes from, who grows it, and what it looks like to cook a meal. I鈥檝e picked my battles and they鈥檙e more in the vein of 鈥淒on鈥檛 hit your sister,鈥� and 鈥淵es, you need to wear pants to temple鈥� than what they eat. Instead, I cross my fingers and hope they grow out of it. I apply mom鈥檚 advice on potty training 鈥� that no kid went to college still peeing her diapers 鈥� to baby food pouches. I figure they鈥檒l probably outgrow them before they move out. And if not, at least it鈥檚 no longer my problem.